I have a feeling you are staring at this picture and thinking I definitely went crazy. Soup?!? In the summer? Calm dooown and carry on! Despite the French name, some people (aheeeem, Julia Child) claim that this is “an American invention”, as opposed to a traditional French dish. French or not, the dish is attributed to Frenchman Louis Diat. He (re)invented the soup in 1917, in New York City while working at the Ritz-Carlton Hotel. Diat was born in Vichy, France, where hot potato and leek recipe was a traditional dish. So, for the opening of the Ritz-Carlton Hotel’s rooftop garden, he decided to serve that same soup of his childhood, only cold and with cream. He called it Crème Vichyssoise Glacée. 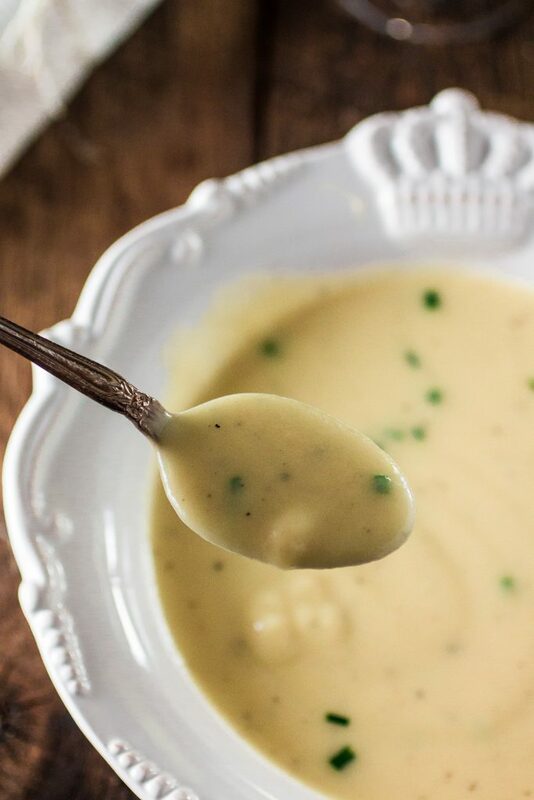 What I like the most about this recipe is that I can make it ahead of time, as the flavors will only get better as the soups chills in the fridge. However, before serving, I like to bring it closer to room temperature, so the flavors can shine. If it’s too cold, you can’t really differentiate all the dimensions in there and it will taste as a plain potato soup. Bleeeeh! My younger self would have never thought that eating cold soup was acceptable. She barely ate soup at all! Thankfully, my palate evolved with time and now I appreciate a plate of this soup for lunch on a hot summer day. As for serving it at a dinner party… Well, let’s say your guests will be impressed and will definitely appreciate you not serving another of those plain boring old salads. In a heavy bottomed pot, or dutch oven, heat the olive oil and the butter, over medium high heat. Sauté the onion until translucent (about 2 minutes). Add the leeks and sauté until soft (about 4-5 min). Add the potatoes and sauté with the onions and leeks for a couple of minutes. Season with salt and pepper. Lower the heat and simmer for 30 minutes, or until the potatoes are tender. Using an immersion hand blender, puree the soup until smooth. Alternatively, you can work in batches using a regular blender. Add the heavy cream and turn the heat back up to medium. Cook for about 5 minutes so it thickens a little. Taste for seasoning and add more salt and pepper if necessary. Add a pinch of freshly grated nutmeg. Remove from heat. Wait for the soup to cool down to room temperature and chill for at least one hour before serving (overnight is better). Garnish with some chopped chives and serve. 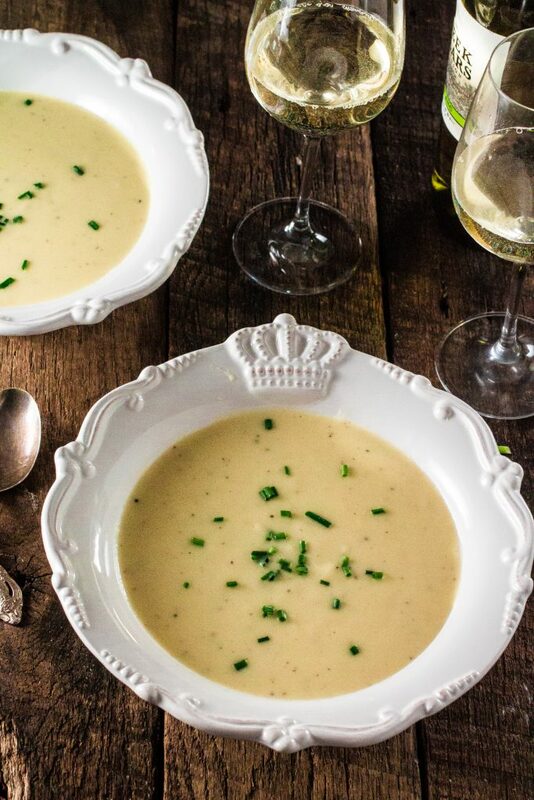 I haven’t eaten many chilled soups, but I love the idea of soup during the summer. Looks delicious! This soup is really refreshing and tasty! Good to know that it can also be served hot, a great idea to cook during our winter that is coming soon! I’ve had warm Vichyssoise but never chilled. What a fabulous idea for summer! Your pics are absolutely stunning too! Happy Weekend! 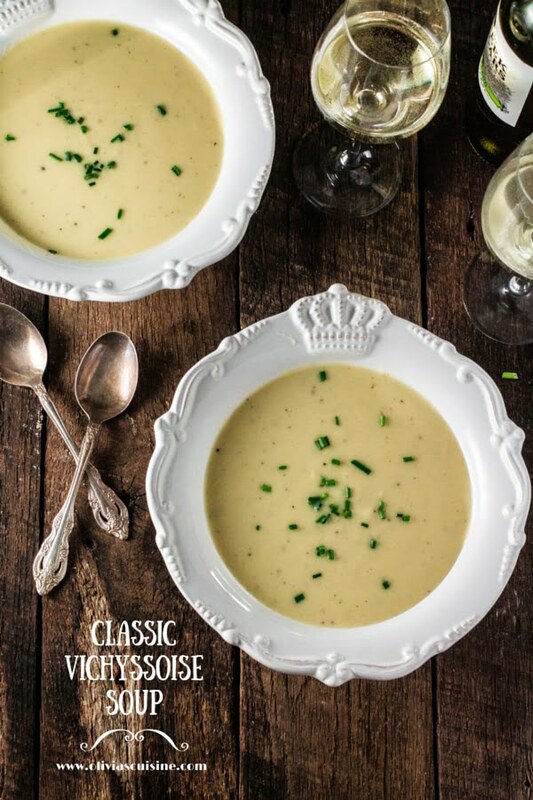 What a beautiful post – it’s been so long since I’ve had Vichyssoise I’d forgotten how good it is. Thanks for sharing. I made vichyssoise this past summer for a relative undergoing mouth cancer treatment. It’s high calorie – which was needed. I am going to try your recipe – thanks! We just got back from a week in France, where I got to cook all week! This sounded perfect as it is near 95 today in Oregon. It turned out better than I imagined, cold, light, and perfect for summer. I have made Julia Child’s recipe in the past, but this one is way better. Oh Susan, I’m so jealous! I’ve never been to France and it’s definitely on my bucket list. :) I hope you had lots of fun! Regarding the leeks. Are they sliced in rounds or lengthwise? Sorry for the dumb question. We will be making this today! Wonderful recipe, and I shall definitely try it. Vichissoise, cold or hot, is one of my absolute favourites. I very often serve it cold as a starter in the summer, when Vitello Tonnato (cold veal with a tuna sauce) is on the menu, and then I use the veal stock for the soup rather than chicken stock. I love it hot as well, when the weather is cold. – The most luxurious version of Vichissoise I have ever had was at a now unfortunately defunct restaurant in Beauchamp Place here in London in 1977: served cold with a slice of lemon, on which a small mountain of Russian caviar was resting! Highly recommended!!! The combination of the delicious soup and the saltiness of the caviar was unbeatable. Please let me know if you try that. 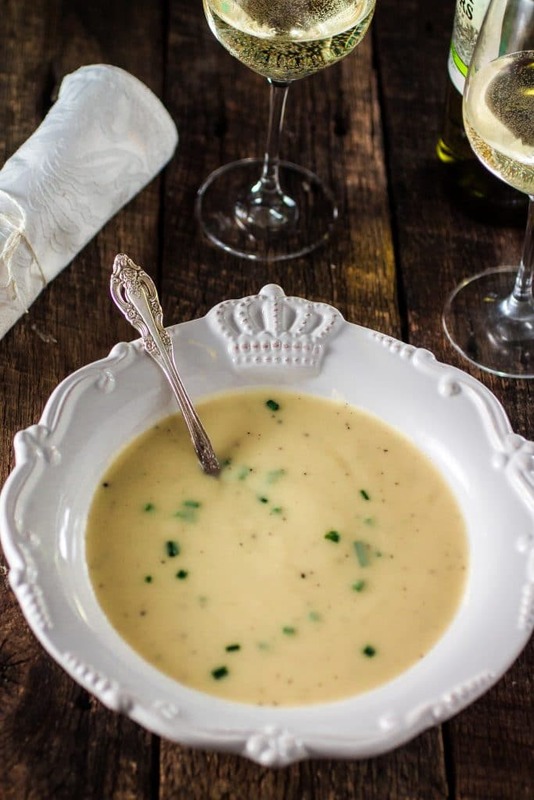 I’ve been making vichysoisse at least once every summer here in New England for over thirty years–a perfect summer soup. I’ve just read your instructions for making the soup and would like to make three suggestions for adjustments to them: 1) no blender of any type should be used once the vegetables are cooked; the result is a bland cream, completely without texture. Instead, use an old-fashioned food mill to achieve a soup with a satisfying substance. 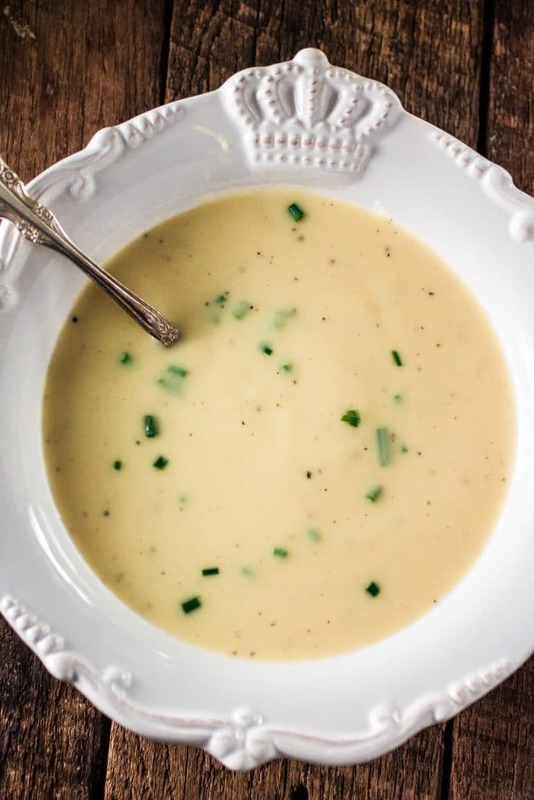 2) use white pepper–not black; vichyssoise should be uniformly white or whitish green. 3) add the cream just before serving it, mixing it in until well-blended. Chives on top are the perfect garnish. I serve the soup with thin rounds of baguette and butter on the table for those who [like me] desire them. I am going to make this with my 5 year old daughter, she is excited to begin her cooking adventures and this is going to be our first side by side meal we make together. She usually stands beside me on her stool while I cook but I think it’s time for her to learn. That being said, what type of potato do you use? A mealy type like a russet or something with a smoother texture like a white potato? I can see the benefits of both but thought I would ask. That’s so adorable! I can’t wait to cook with my daughter. “6” large leeks???? that’s a LOT of leeks! I am slicing right now and a tad skeptical, but if you say so. Anthony Bourdain’s recipe calls for 8. Talk about a lot of leeks!